Lance Lynn held the Angels to one run over six innings, Miguel Sano had a run-scoring hit and Robbie Grossman hit a homer. You’d think that’d be a recipe for victory, but the bullpen gave up three runs and the Twins scored only twice. Let’s start out by focusing on the positives. Lynn is looking like the guy who was an above-average MLB starter for so long with the Cardinals. This was his seventh start since the end of April, five of those have been quality starts. His ERA over that stretch is 3.05. This is as confident as I’ve been in the Twins rotation, from top to bottom, in more than a decade. That’s more of an indictment on how bad the team’s starting pitching has been, but still, a nice development. On the negative side, the only good that Lynn's turnaround may do for the Twins is improve his trade value. The Twins lost to a good Angels team while Cleveland beat Detroit. The lineup managed just two runs, the first on a Sano double and the second on a go-ahead home run from Grossman. Lynn exited this game with the Twins leading 2-1, but the bullpen couldn’t hold. Ryan Pressly gave up a two-run homer in the seventh. This was his third-straight game in which he gave up two earned runs. He’s given up seven earned runs over his last four innings pitched. He should be nowhere near a high-leverage situation right now, and could probably benefit from a trip to the DL. Addison Reed gave up a home run to the first batter he faced in the eighth. He’s now given up four earned runs over his last five innings pitched. Meanwhile, Trevor Hildenberger hasn’t given up a run of any kind — earned, unearned, inherited — over his last eight appearances. Might be time to mix things up a bit. The one guy who did pitch a scoreless inning out of the bullpen, Tyler Duffey, was optioned after the game. Baseball is cruel. Eddie Rosario and Eduardo Escobar both had multi-hit games, because of course they did. Throwin the Pressley is the new throwin in the Ron Davis. Presley has turned back in to his usual pumpkin self. I'm so over this team. Today was the final straw. Molitor's overuse of Pressley is simply criminal. So much wrong with this team that doesn't have to be. Such a waste. Overuse of bullpen. Cycle in some new guys from the minors, soon. How many games in a row has Reed given up a HR? Add the 2 inherited runners scored to Reed's 4 earned in the last 5 innings (it was the first game of this run). Those runs lost a game, too. The pen is imploding, and Militor has worn out the two that were doing the best. Not anymore. The one guy who did pitch a scoreless inning out of the bullpen, Tyler Duffey, was optioned after the game. What do you think the corresponding move is? Back to 12 pitchers and calling up Cave? Motter? Or swapping Duffey for another reliever like Busenitz? This team needs new hitters that can make contact and recognize pitches- STAT! Molitor gets a formula in his head for negotiating the late game innings, it becomes a recipe which has to be followed, he lights the fuse and walks away. So happy that it is a World Cup year. The bullpen needs to be fixed. Give time for Pressly and Reed to reset because clearly both have lost the feel of their pitches. They're both still on pace for 90+ appearances which is unsustainable over the course of the season. 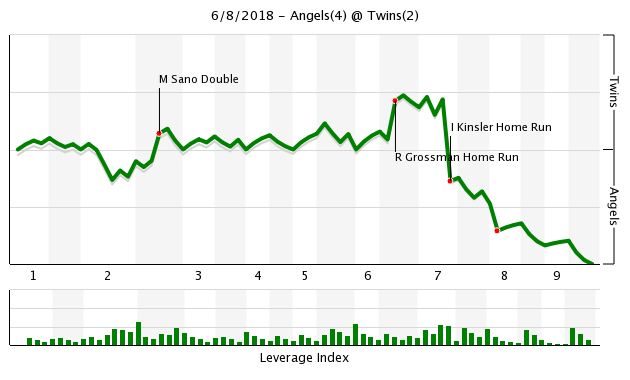 Outside of Grossman's homerun, just another normal game for the Twins. Rosario, Escobar and Kepler(kind of) provide some offense and the rest of the lineup got their whiffs in. Why the heck is Dozier batting leadoff? Why is Sano in the lineup? Morrison is a bust. No catcher here. How in the world was this team expected to make it back to the playoffs? Escobar was suppose to be a utility player and he's one of your best hitters? Nobody can bunt. They won't try to steal a base. They don't even try to hit to the opposite field. Shouldn't they be taught that in the minors? How to hit to ALL fields instead of pull, pull, pull. Watch Rosario and Escobar. They are the only 2 players they have that are hitting and they are the only 2 that hit to all fields. Are the rest of the players, coaches included, that blind? Gotta love them Twins, for years they had an offense that could score a lot of runs, but they didn't have any starting pitching. Now that they have starting pitching, they can't score any runs. They won't buntfor hits and they won't steal but they get picked off base and get thrown out on the bases more than I have ever seen.Garver appears to have no instincts on either side of the ball. Sano would benefit greatly from using all fields and by toning his swing down. I most definitely did not expect this team to make the playoffs. The team I thought had a decent chance of the playoffs included Mauer, Buxton, Polanco and Santana along with Sano and Dozier having decent years. I don't know how capable this team is currently but they should be able to achieve the goal of not playing ugly baseball. I get 89 for Pressley and 81 for Reed rather than 90+.Reed has some history being effective with heavy usage.Pressley does not.I would prefer both of them pitching two innings when sharp which would give them the same amount of innings in half the appearances. When Pressly came into a one-run game last night, my stomach tightened and my nerves were shot.Then I watched him pitch breaking ball after breaking ball to two straight batters and the game was over.Not only is he on track to pitching 90 games, whomever is making the decision of what pitches to throw is brain dead.Maybe he should mix in his 97 mph fastball? After last night's demotion, I expect Tyler Duffey is looking at a calendar to see how many days it is until he becomes a free agent and can get out of this circus.Unfortunately, they can't send Pressly and/or Reed out to the minors and I suspect Molitor is begging for a new arm.Bigger question is:Will he use it or abuse it?And yes, that may be the first negative comment I have ever made about our Manager.At least the first I remember. 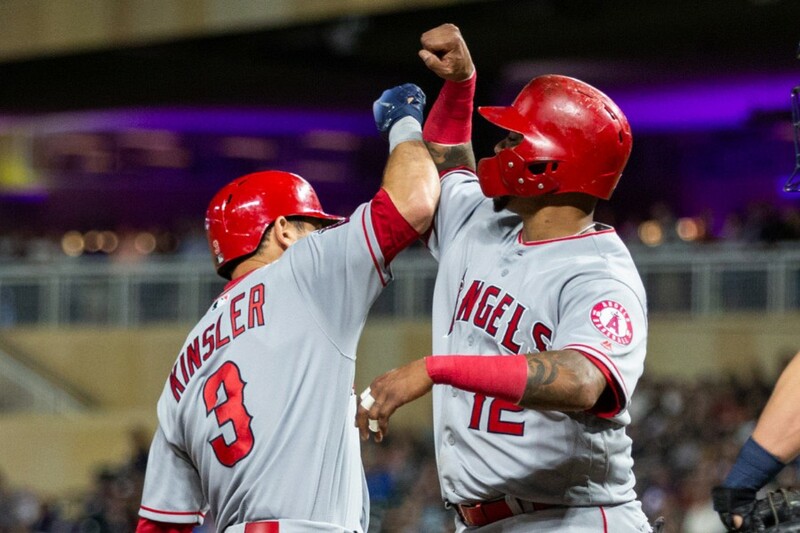 The wild card isn't an option so the only way into the playoffs is to win the division.After every loss of a winnable game (2 this week), that task is getting harder and harder.Maybe Polanco's return will be the shot in the arm they need to get on a streak.He is back in what, three weeks? And yes, Tom, Lance Lynn is certainly improving his value to someone else come July. Which makes the Duffy move even more baffling. He's been effective and clearly Reed and Pressly are overused, so why reduce the bullpen by another arm? I suppose that the logic could be that Molitor isn't going to use any other bullpen pieces anyway, why not bring up another position player... though I'm curious to see if he actually uses Cave. I feel like the bullpen is masking the problem that the hitters aren't scoring enough runs. You're not going to win games when you score just two runs. Also, it's nice to see Lynn turn back into the pitcher he once was. These last few starts for him have looked like the guy I thought the Twins signed. He's clearly worked hard to improve his game after starting so dreadful. I don't feel like this team should be 6 games under .500 with a rotation like this. Your comments about Lance Lynn improving his value got me thinking.To move him in July will require their getting an excellent return. He may be one of the better pitchers available to contending teams.But more important, I don't see why they wouldn't be comfortable giving him a qualifying offer to a one year contract at the end of the year.He wasn't acquired mid-season, so I believe they would get a COMP pick if he signed elsewhere.Would that be a first round or second round pick?So any offer would have to be for something better than that in players and or International money. But more important, I don't see why they wouldn't be comfortable giving him a qualifying offer to a one year contract at the end of the year. Players can't get more than 1 qualifying offer in their career anymore, per the new CBA. So we couldn't offer one to Lynn. A couple of comments from the Far East. This was the second game I was able to watch on TV this season, interestingly both were Lynn vs.the Angels. Lynn looked awful the last time he pitched; this time, he was a completely different hombre. He was superb. Pressly may be tired, but what was more disconcerting was his pitch selection. Of the first 18 pitches he threw, I believe that only three were fastballs. Maldonado and Kinsler were both sitting on breaking balls, and each finally, got one they could rip. This visibly upset Pressly and he proceeded to fire four straight fastballs to an overmatched Trout. I don't who is to blame for this (Pressly, Garver, Pitching coaches? ), but when a guy can bring heat at 95+, he should be throwing that pitch often. The old tried and true adage applies here: If you're gonna get beat, get beat with your best pitch. I can give Reed the benefit of the doubt, because he has a track record with heavy usage. Pressly's track record is not so good when Molly leans on him. Surprised Duffy is being sent down he has pitched well recently. I would rather have seen Pressly get a little DL break - possibly Reed as well.They have been used so much I think they need a rest break.Seems like when they have been brought in recently they each surrendered runs.Other option is bat Pressly at leadoff in the lineup and pinch-hit for him first at-bat so Molly can't use him for a couple of games. Just a little tidbit of info. in the last 10 games. Is Wade going to AAA finally, since they are down an OF? Not sure I get this move, they need arms, I think.